Beetroot is definitely something I’ve grown to love over the years. As a kid, you never would’ve got me eating it. It’s purple for god’s sake! But recently I’ve really learned to love it and after this, you will too! What’s more, one of the finest chefs in the land: Dan Doherty is throwing his Duck & Waffle weight into promoting the purple stuff. I’ve included two of his awesome recipes below too. Pre-heat the oven to 200°C and toast the walnut halves for 5 minutes. Don’t let them burn. Place the walnut halves, beetroot and herbs in a food processor and whizz up until well combined. Add the olive oil, maple syrup, lemon juice, salt and pepper and blend again until you have your hummus at the desired consistency. Serve in a bowl, garnish with a mint leaf and serve with warm, toasted pitta bread and dig in! On a gas hob, blacken the skins of the aubergine until burnt. It’s best to skewer it so you can hold at a safe distance. When all blackened, place into a roasting tray and put in the oven for 10 minutes to soften. When ready, split open and scoop out the flesh, and roughly chop so it’s broken down. 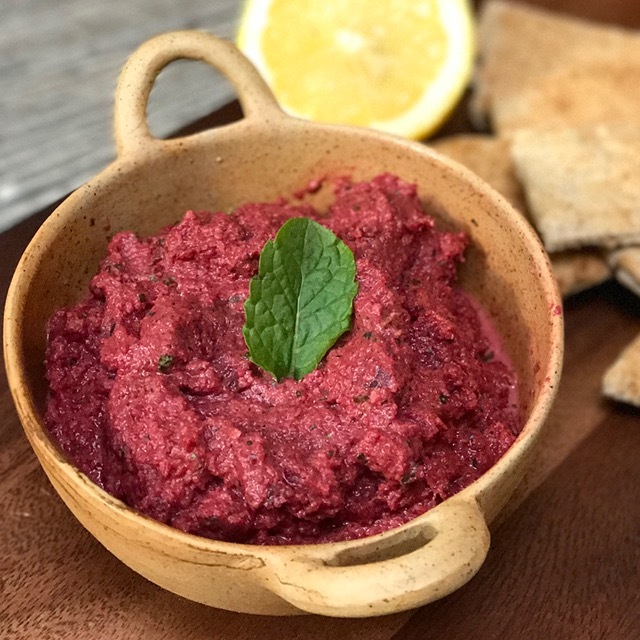 In a food processor, add the beetroot, tahini, toasted cumin, thyme leaves, garlic and lemon juice and blitz until smooth. Season with salt and pepper. Take out and into a bowl, add the aubergine and stir through. In a dry frying pan, toast the pine nuts until golden. 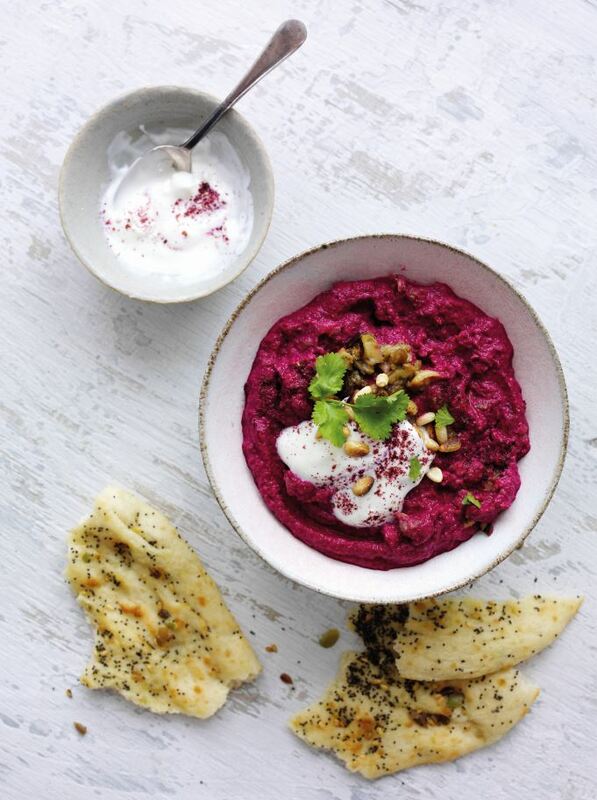 Serve the beetroot and aubergine mix in a bowl, and add a good spoon of yogurt on top. Sprinkle over the pine nuts, sumac and coriander leaves to finish. 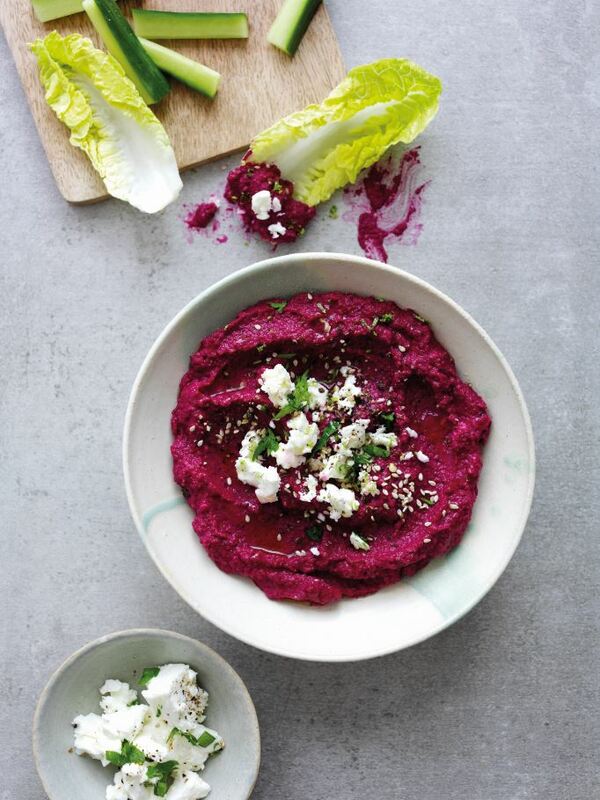 In a food processor, add the beetroot, feta cheese, tahini and lime juice. Blend until completely smooth, adding a tablespoon of water if needed to get it going. To serve, spoon the puree into a pot, and crumble the remaining feta cheese on top. Drizzle with olive oil and sprinkle the seeds and the parsley over the top. Grate the lime zest over and sprinkle a touch of sea salt and a twist of black pepper to finish. This post was kindly sponsored by Love Beetroot.